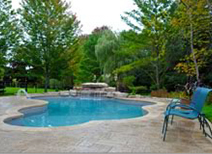 Creative Pools and Landscaping Satisfied customers share their pleasant experience. Find Out how we can make your landscaping dream design a reality. We install pools from Pickering to Etobicoke and Toronto to Barrie. CALL MATT TODAY AT 905-836-6778. "We would like to compliment you on our pool and backyard landscaping project. Both the landscaping crew and the pool crew were very professional, hard-working and courteous throughout the entire project. A special thanks goes out to your foreman Andre whose coordinating skills kept the project moving without delay. You've transformed our backyard into an inviting oasis and we lok forward to many years of enjoyment from it." "Our pool, waterfall, deck and landscape design are absolutely stunning, a backyard like an exotic vacation destination! The final outcome of the project exceeded all of our expectations! Each one of your skilled pool, electrical and landscaping team are professionals with high-end quality craftsmanship and customer focus as number one! Their commitment to quality work always prevailed and is evident in the final product. You, together with your Project Leader, were always available when needed, and were always willing to hear and deal with any questions or last minute project changes. Your team was consistently on time, working daily on our project (never leaving our site to do another job), and working well past a regular 8 hour day, to ensure our project was completed on time. It was such a positive experience dealing with you and your Company! Even my children commented on the caliber of your team! " "We had our pool designed by Matt and his team at Creative Pools & Spas about 4 years ago. The pool and the landscaping needed to be designed and built within a very tight space but I wanted a pool that would function as a pool and be architecturally pleasing at the same time. Creative Pools met the challenging design criteria and 4 years on, I have no construction or equipment issues and it still looks great and the kids love it. We continue to use Matt and his team to close the pool yearly - they're clean, efficient and very reasonably priced. Excellent service. Thanks guys." "We had our pool and surrounding patio installed last year (2012) and we our overall experience was excellent. One of the things most appreciated was the architectural design of the patio, the gardens as well as the pool itself. Everyone who has visited us has commented on the overall design of our back yard and asks who did the work. We cannot recommend Matt and his team more highly. If anyone is in the market for a pool and/or a new patio and gardens, be sure to include Creative Pools & Spas as a supplier." "I highly recommend Matt and his team at Creative Pools & Spas in Newmarket. Our pool and surrounding patio was constructed efficiently within several weeks and during the entire process Matt and his team were attentive to our concerns and any requests for modifications. There were no suprises during the process as Matt mapped out the stages from construction to completion. The job site was secured tidied at the end of each day as they were considerate of our neighbours. Three years into enjoying our pool and backyard, we have not experienced any problems with its construction or with the equipment and continue to utilize his team for our yearly pool opening and closing. We thoroughly enjoy our backyard every year...many thanks!" "Creative Pools and Spas installed our pool in late 2011. I was very impressed with their professionalism and attention to detail not only with the pool installation but also with all the landscaping construction. Matt and his crew are fabulous people who treat their customers with respect. I have already recommended Creative Pools and Spas to a friend of mine who is looking forward to his first season of enjoying his pool. Looking forward to a lifetime of memories from our backyard pool. Thanks Matt!" I hired this company last summer to transform my backyard. Was very impressed and satisfied with the whole experience! The pool and landscaping team are professionals with high-end quality craftsmanship and customer focus as number one! Will definitely recommend Creative Pools and Spas to family and friends!"